Mrs. Helen Vulgaris, age 102, passed away Saturday, October 28, 2017 in Columbus Ohio. She was born in Muskegon, Michigan on February 28, 1915 to Perry & Sophia (Mays) Antonopulis and married Chris Vulgaris on January 26, 1936. Helen spent most of her life in Muskegon MI. 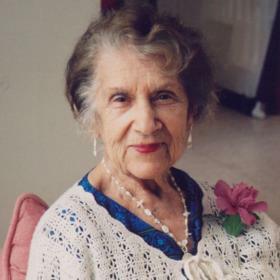 She was a long time member of the Greek Orthodox Church where she was, for many years, an active member of the Philoptochos Society and the Daughters of Penelope. Helen was proud to be a “homemaker” and was skilled in all the domestic arts of the time. She was an expert at knitting, crocheting, sewing and embroidery. Her children and grandchildren treasure the beautiful table cloths that she embroidered and the coverlets she knitted or crocheted. 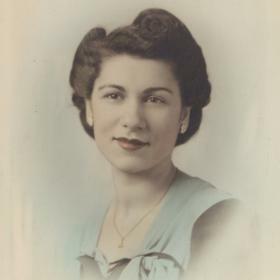 She was known in Muskegon for her beauty and for her mastery of Greek cooking and baking. Her baklavas, kourambiethes and melomakarona were the best. She didn’t drink or smoke, but she could play poker to win. Although Helen experienced tragedy in her life, she had a joyous spirit and a natural optimism. She liked people and was especially kind to children. Her own children loved her and her grandchildren adored her. She is always in our hearts. MAY HER MEMORY BE ETERNAL. Daughter, Matina (Peter) Ross; grandchildren, Laura (John) Wright, Chris (Pat) Vulgaris, John (Marcy) Vulgaris, Anthony (Rachel) Vulgaris, Bethany (Scott Taylor) Ross, Mikaela (Zsolt) Szollosi; 10 great grandchildren and 4 great-great grandchildren. She was preceded in death by her husband Chris, sons Perry and Gus, and daughter Diane. Thursday, November 2, 2017, 11:00 am at Annunication Greek Orthodox Church with Fr. John Sakellariou officiating. Interment in Sunrise Memorial Gardens. Thursday, 10:30 am to 11:00 am at Annunication Greek Orthodox Church.